As part of the Program on Topological Aspects of Condensed Matter, a weekly seminar will be held on Mondays from 10:00-11:30pm in CMSA room G10. Abstract: Classification and construction of symmetry protected topological (SPT) phases in interacting boson and fermion systems have become a fascinating theoretical direction in recent years. It has beenshown that the (generalized) group cohomology theory or cobordism theory can give rise to a complete classification of SPT phases in interacting boson/spin systems. Nevertheless, the construction and classification of SPT phases in interacting fermion systems are much more complicated, especially in 3D. 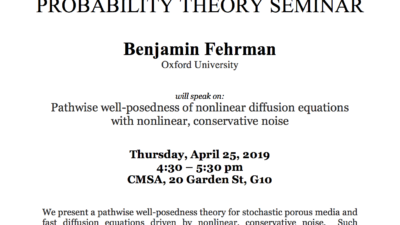 In this talk, I will revisit this problem based on the equivalent class of fermionic symmetric local unitary (FSLU) transformations. I will show how to construct very general fixed point SPT wavefunctions for interacting fermion systems. I will also discuss the procedure of deriving a general group super-cohomology theoy in arbitrary dimensions. Abstract: I will give a pedagogical overview of new topological phenomena that occur in systems that are driven periodically in time (Floquet systems). As a warm-up, I will review new topological invariants in free-fermion Floquet systems. Then, I will discuss the richer physics that occurs in interacting Floquet phases, stabilized in systems with strong quenched disorder by many-body-localization (MBL). 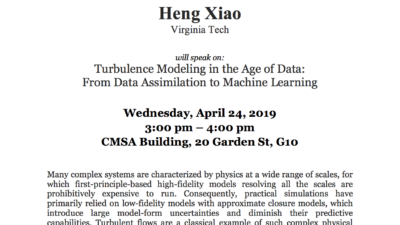 Finally, time permitting, I will explain how to realize interacting topological phenomena in a metastable (“pre-thermal”) regime of a clean system. Abstract: There are 230 space groups and 1,651 magnetic space groups in three dimensions. Thankfully, these are finite numbers, and one might go about solving all the possible ways free electrons represent them. This is a central question in the nine-decade-old band theory, which is long-thought to be solvable if only one had the time and patience to crank through all the cases. In this talk, I would describe how this problem can be solved efficiently from the modern perspective of band topology. As a by-product, we will describe a simple method to detect topologically nontrivial band insulators using only symmetry eigenvalues, which offers great computational advantage compared to the traditional, wave-function-based definitions of topological band invariants. Abstract: Symmetry protected topological (SPT) phases have attracted a lot of attention in recent years. A key property of SPTs is the presence of non-trivial surface states. While for 1+1D and 2+1D SPTs the boundary must be either symmetry broken or gapless, some 3+1D SPTs admit symmetric gapped surface states that support anyon excitation (intrinsic topological order). In all cases, the boundary of an SPT is anomalous – it cannot be recreated without the bulk; furthermore, the anomaly must “match” the bulk. I will review this bulk-boundary correspondence for 3d SPT phases of bosons with topologically ordered boundaries where it is fairly well understood. I will then proceed to describe recent advances in the understanding of strongly interacting 3+1D SPT phases of fermions and their topologically ordered surface states. Abstract: Fracton phases are new kinds of highly-entangled quantum matter in three spatial dimensions that are characterized by gapped, point-like excitations (“fractons”) that are strictly immobile at zero temperature, and by degenerate ground-states that are locally indistinguishable. Fracton excitations provide an alternative to Fermi or Bose statistics in three spatial dimensions, and these states of matter are a gateway for exploring mechanisms for quantum information storage, and for studying “slow” dynamical behavior in the absence of disorder. I will review exactly solvable models for these phases, constructions of these states using well-studied two-dimensional topological phases, and a model in which the fracton excitations carry a protected internal degeneracy, which provides a natural generalization of non-Abelian anyons to three spatial dimensions. I will then describe recent advances in categorizing these states of matter using finite-depth unitary transformations. Abstract: The notion of a higher symmetry, namely a symmetry whose charged objects have a dimension greater than zero, is proving to be very useful for organizing our understanding of gauge theories and topological phases of matter. Just like regular symmetries, higher symmetries can be gauged, spontaneously broken, and can have anomalies. I will review these aspects of higher symmetries and motivate why beyond their conceptual utility, they are often an indispensable tool for making statements about dualities and phase diagrams of theories with gauge fields. Abstract: QED3-Chern-Simons and QCD3-Chern-Simons theories are interesting critical theories in the 2+1 dimension. These theories are described by gapless Dirac fermions interacting with dynamical gauge fields (U(1), SU(N), U(N), etc.) with a possible Chern-Simon term. These theories have fundamental importance as it will flow to the 3D conformal field theories and have interesting dualities in the infrared. Various of condensed matter system are described by these critical theories. I will introduce several examples including the Dirac spin liquid in the frustrated magnets (kagome, triangular lattice), quantum phase transitions in the fractional quantum Hall systems and Kitaev materials. Abstract: I will present an overview of how topological states of matter with global symmetries can be described using tensor networks. First reviewing the classification of 1D symmetry-protected topological phases with matrix product states, before moving on to the description of 2D symmetry-enriched topological phases with projected-entangled pair states. Abstract: I will discuss a classification of 3+1D topological orders in terms of fusion 2 category. The 3+1D topological orders can be divided into two classes: the ones without emergent fermions and the ones with emergent fermions. The 3+1D topological orders with emergent fermions can be further divided into two classes: the ones without emergent Majorana zero mode and the ones with emergent Majorana zero mode. I will present pictures to understand those 3+1D topological orders. Title: Many-body scar states with topological properties in 1D, 2D, and 3D. Abstract: We construct (some) exact excited states of a class of non-integrable quantum many-body Hamiltonians in 1D, 2D and 3D. These high energy many-body “scar” states have area law entanglement entropy, and display properties usually associated to gapped ground states of symmetry protected topological phases or topologically ordered phases of matter, including topological degeneracies. Abstract: Some exotic ground states of 2D quantum magnets can be accessed through sign-free quantum Monte Carlo simulations of certain “designer Hamiltonians”. I will discuss recent examples within the J-Q family of models, where the standard Heisenberg exchange J on the square lattice is supplemented by multi-spin terms Q projecting correlated singlets, such that dimer (columnar valence-bond) order is favored. In addition to a possible deconfined quantum critical point separating the Neel and dimer phases, I will discuss recent work on a modified model where a rather strongly first-order transition between the Neel state and a plaquette-singlet-solid is associated with emergent O(4) symmetry up to length scales of at least 100 lattice spacings. This type of transition may be realized in SrCu2(BO3)2 under pressure. I will also discuss a random-singlet state obtained when randomness is introduced in a system with dimerized ground state. This type of state may be realized in some frustrated disordered quantum magnets. Abstract: Motivated by studying the entanglement structure of certain symmetry protected topological phases, we construct a non-trivial quantum cellular automaton in a Hilbert space for a 3d lattice of spin 1/2 degrees of freedom. This is an operator which takes local operators to nearby local operators, but is not locally generated. We discuss implications for the classification of SPT phases in equilibrium and Floquet settings. Abstract: This talk will explain some properties of the fracton state devised by Jeongwan Haah. A fracton state has excitations that are extremely localized–it is impossible for them to move (unlike Anderson localization, e.g.–Anderson localized excitations can move if there is an external field to provide energy). One can understand why in a simple way using “mod 2” Fourier analysis. I will explain this, and also introduce “finite fields”, which are the number systems one needs to define exponentials mod. 2. Abstract: Noether’s theorem is one of the fundamental laws of physics, relating continuous symmetries and conserved currents. Here we explore the role of Noether’s theorem at the deconfined quantum critical point (DQCP), which is an exotic quantum phase transition beyond the Landau-Ginzburg-Wilson paradigm. It was expected that a larger continuous symmetry could emerge at the DQCP, which, if true, should lead to conserved current at low energy. By identifying the emergent current fluctuation in the spin excitation spectrum, we can quantitatively study the current-current correlation in large-scale quantum Monte Carlo simulations. Our results reveal the conservation of the emergent current, as signified by the vanishing anomalous dimension of the current operator, and hence provide supporting evidence for the emergent symmetry at the DQCP. We also extend our discussion of emergent conserved current to the recently proposed one-dimensional analog of DQCP and confirm the emergent O(2)xO(2) symmetry in that case. Finally, I will briefly discuss the significance of our findings in a potential realization of DQCP in the Shastry-Sutherland lattice material SrCu2(BO3)2. Abstract: I will talk about quantum-classical mappings for real-time observables in some simple many-body systems (random unitary circuits). 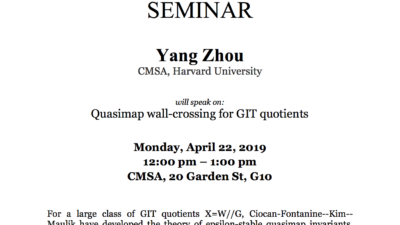 Specifically I will discuss how (1) entanglement entropy growth and (2) two-point correlation functions in these systems can be related to partition functions for interacting random walks. If time permits I will mention a phase transition in the entanglement structure of a repeatedly measured quantum state. Abstract: The quantum information study of quantum codes and quantum memory has led to the discovery of a new class of exactly solvable lattice models called the fracton models. The fracton models are similar to the better understood topological models in that they also support fractional excitations and have stable ground state degeneracy. But it is also clear that the fracton models exist beyond the realm of conventional topological order due to their extensive ground state degeneracy and the restricted motion of their fractional excitations. In this talk, I will present a new framework, which we call the “foliated fracton order”, to capture the nontrivial nature of the order in a large class of fracton models. Such a framework not only clarifies the connection between various different models, but also points to the direction of search for interesting new features. Abstract: I’ll discuss Joint work with Matt Hastings on local endomorphisms of the operator algebra. We found these have a cohomological invariant similar to that of an incompressible flow.